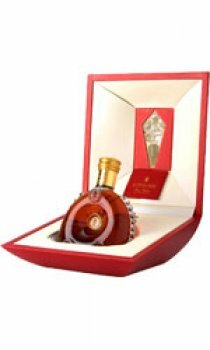 The highest quality Cognac on the market today, Louis XIII has been carefully tended by three generations of Remy Martin cellar masters. The result is a magical combination of savoir-faire, art and patience. Remy Martin Louis XIII uses only grapes from the Grande Champagne region which guarantees it's unique, exclusive quality. It is blended from eaux de vie, some more than a century in age, then it is aged in 'tiercons', barrels that are several hundred years old, in a cellar set apart for it alone. Undoubtedly the world's finest, this exceptional Cognac has always been a favourite in the world of politics, fashion, and art. It's connoisseurs include Christian Dior and Elton John. Queen Elizabeth II, who was served Remy Martin Louis XIII Grande Champagne Cognac in Versailles Palace in honour of her 1957 visit to France, and Winston Churchill, who celebrated his election victory with it in 1951. It's colour is a very dark golden yellow with a fiery red tint and mahogany hue. The first nose is of narcissus, jasmine, very old tawny port, cigar box scent, curry, saffron, nutmeg and passion fruit. The second nose is of violet, iris, litchi, pineapple, eucalyptus and sandalwood. The first palate is very concentrated and wonderfully rich in aromas, warm and harmonious. Second palate is of the highest complexity including aromas from the first and scond noses. A long finish of up to an hour. I bought a bottle of Louis XIII to share with my father as soon as I could afford to as it was on our "100 things to do before I die" list. When I first tasted it, I thought it was good but was it worth nearly £1k? After the second sip, the flavours came through and were magnificent. The smooth yet complex taste lasted for ages. The difference from a lesser Cognac is noticeable, justifying the high price. Overall, an experience not to be missed if you can find the money.